Nicholas Bisciotti's Blog: SharePoint Server 2013 New Web App "This Page Can't Be Displayed", Central Admin "Upgrade Required"
SharePoint Server 2013 New Web App "This Page Can't Be Displayed", Central Admin "Upgrade Required"
This is a walk through of the process I took to solve a problem that I encountered in a SharePoint 2013 on-premises farm. When attempting to create a new Web application, I received an error that said. While the Web application appeared in Central Administration and the Content Database existed in SQL Server and was visible in Central Administration Manage Content Databases, I could not create a new Site Collection in the the new Web Application. I attempted to create another Web Application and received the same dialog message, "This page can't be displayed". After investing the farm health, I found that the Servers in Farm page in Central Administration was showing "Upgrade Required". Meanwhile, the Upgrade Status in Central Administration appeared to be OK with all "Succeeded" messages and no errors. I opened a Command Prompt and ran stsadm.exe -o localupgradestatus. This took a few minutes to run but once the command completed revealed that there were 2 objects that "still need upgrade". These two objects were the two Web applications I attempted to create earlier. Internet Information Services (IIS) showed Web Sites and Application Pools for each Web application. However, I discovered that the C:\InetPub\WWWRoot\WSS\VirtualDirectories\WebApplication directories for the problem Web Applications were missing files. It appears that the directories were only partially created. 5. 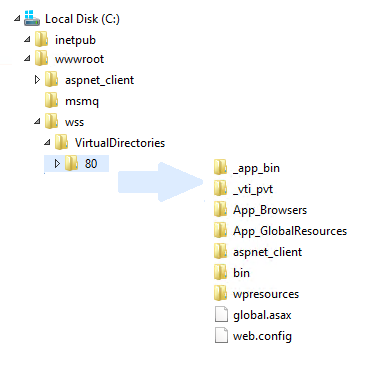 Verify the folder structure of C:\InetPub\WWWRoot\WSS\VirtualDirectories\WebApplication directories. It should look like the image below. 6. 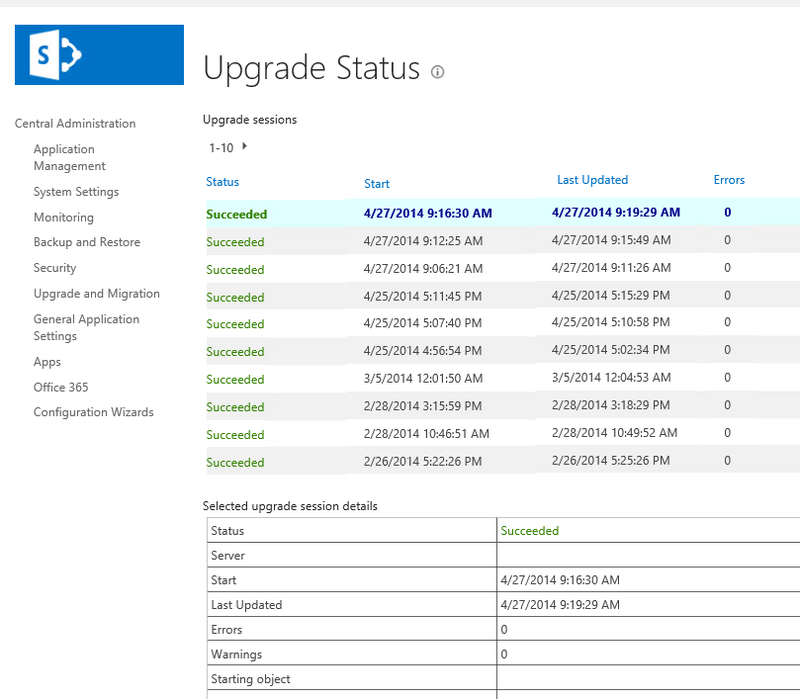 Verify that stsadm.exe -o localupgradestatus shows zero (0) objects still need to be upgraded. 7. Create a new site collection in the Web application and browse to it as a test that the Web Application is fully functioning. 9. 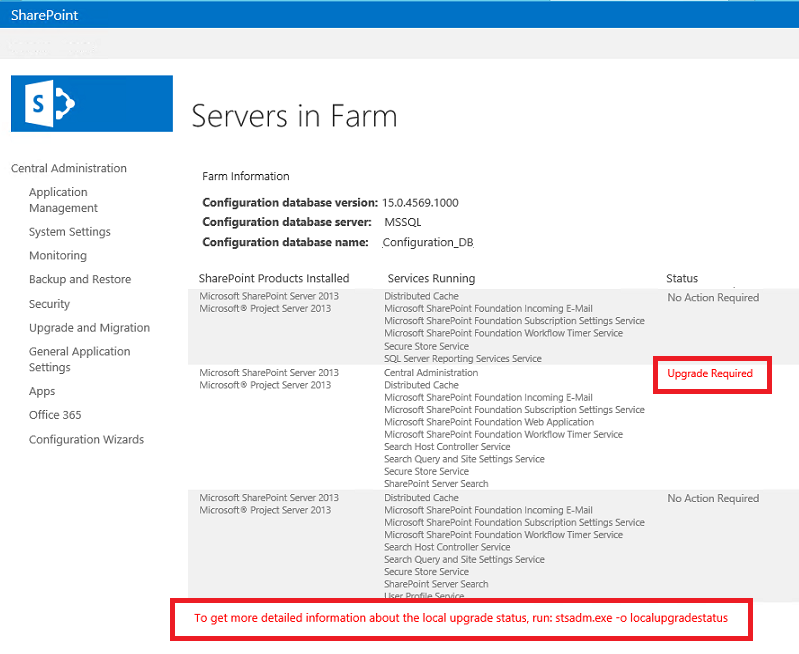 Verify Central Administration Upgrade Servers in Farm shows Status of "No Action Required". Maxwell, R. (April, 2013). 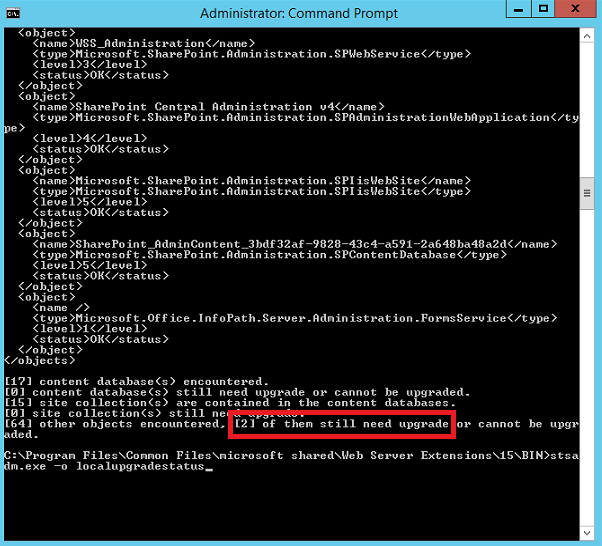 Why SharePoint 2013 Cumulative Update takes 5 hours to install? Retrieved March 24, 2015 from http://blogs.msdn.com/b/russmax/archive/2013/04/01/why-sharepoint-2013-cumulative-update-takes-5-hours-to-install.aspx.